PUMA Bike: Designed for anti-theft and everyday riding. 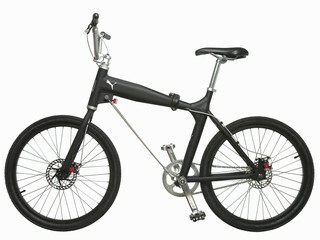 The Puma Bike is designed for urban mobility - hence urban commuters in general will be the ones benefiting. Small everyday annoyances when riding your bike in town -bringing your heavy security lock, climbing staircases, maneuvering urban obstacles just to mention a few- are what make people discard the bike. Bicycling is a convenient short cut to physical wellbeing and daily exercise and an eco-friendly and convenient alternative to polluting cars. With its integrated folding and ingenious locking mechanisms this newly evolved bike typology addresses the abovementioned annoyances and simply diminishes the hassle of riding the urban environment. The integrated locking system uses the structural Down Tube-Wire. If the lock is broken so is the bike – why steal it then. 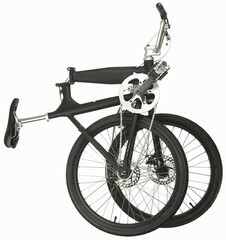 A quick’n’dirty semi-folding mechanism & folding pedals make public transport, cars & elevators more accessible. The bike goes where you go. U-GEOMETRIC Designed for everyday riding, the bicycle combines commuter functionality with the ease of use of a BMX: small and perfectly formed. SINGLE-SPEED With no gear shifting, this is pedaling at its best. As a single speed, the bike requires little maintenance and keeps transmission loss at a minimum. DT-WIRE LOCK The unique locking system uses a Down Tube (DT) chain lock, which is integrated as a structural part of the frame. If the lock is broken so is the bike – why steal it then? SEMI-FOLD The quick and easy semi-folding mechanism and folding pedals make public transport, cars and elevators more accessible. Built for town convenience, the bike goes where you go.